One of the many things on my on-going to-do list is to devote an entire day to typing up every Halloween poem/song I want as a printable. It really would take an entire day. My list is quite lengthy! I don't have an entire day to do that right now, but I had to get this poem done. My mom taught me this poem when I was young. I've had it memorized for years. I'm not exactly sure where it came from. I have a vague recollection of it in an old book. I tried to Google the words, but came up with nothing as far as the source goes. Anyway, it's a favorite, so I had to share. I hope you enjoy it as well. And if any of you out there have information on the source, please let me know. 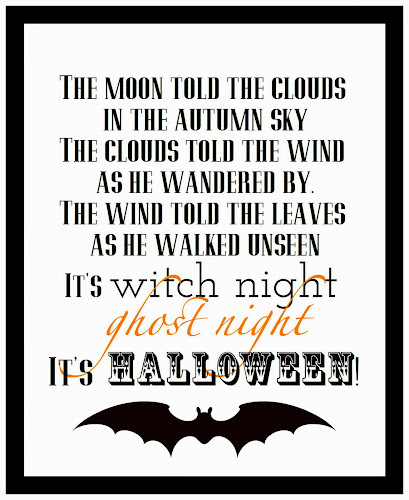 Love this Halloween verse! Thank you so very much. I love it too!! You are very, very welcome. Happy Halloween! Fun! Can't wait to recite it to my kids! Love your blog....love, love, love. It is such a fun one to do with kids! Thanks so much for your sweet comment, Rach! You totally made my day. I sure appreciate it! Thank you for visiting, and I'm so glad you enjoy what I do here. Have a great weekend!